Associate Attorney General Thomas J. Perrelli is responsible for reversing a voter intimidation charge against the New Black Panthers, but many had a hand in it after the interested “political” and “racial” factions put their heads together. Read the latest update here. After intimidating voters at a Philadelphia polling precinct, decked out like a military thugs from a third world country, wielding at least one 2-ft. long nightstick, a civil lawsuit was filed. The three men charged refused to show up for their court cases for five months – that’s 5 months – and they did not show! The government won a default judgment in federal court against the New Black Panthers and three of their men. In April, however, department lawyers were told to drop the case – after already procuring the default judgment. Unbelievable. Why would the case be dropped? Wouldn’t you know it is always about politics? Justice Department spokeswoman Tracy Schmaler told The Washington Times that the department has an “ongoing obligation” to be sure the claims it makes are supported by the facts and the law. She said that after a “thorough review” of the complaint, top career attorneys in the Civil Rights Division determined the “facts and the law did not support pursuing the claims against three of the defendants. Schmaler is certainly a Liberal. She had the audacity to says “we [DOJ] are committed to vigorous enforcement of the laws protecting anyone exercising his or her right to vote.” Only Liberals have that special kind of audacity and vigor. What about the people of Philadelphia? What about the people inside and outside the polling place? What about Mr. Bull – a man who signed an affidavit tell what he saw that day? In my opinion, the men created an intimidating presence at the entrance to a poll,” he declared. “In all my experience in politics, in civil rights litigation and in my efforts in the 1960s to secure the right to vote in Mississippi … I have never encountered or heard of another instance in the United States where armed and uniformed men blocked the entrance to a polling location. Can you believe the DOJ never did get around to entering Mr. Bull’s affidavit! I know it is drama to say that I want to cry for this country and for my children, but that is how I feel. This is not justice. Rep. Frank R. Wolf (R-VA), a senior member of the House Appropriations Committee was prevented from interviewing the “front-line” lawyers who brought the charges. That’s transparency for you! Why am I being prevented from meeting with the trial team on this case? Mr. Wolf asked. “There are many questions that need to be answered. This whole thing just stinks to high heaven. If showing a weapon, making threatening statements and wearing paramilitary uniforms in front of polling station doors does not constitute voter intimidation, at what threshold of activity would these laws be enforceable? Mr. Wolf asked. …in a June 16 letter to Justice that the decision to drop the case caused it “great confusion, since the NBPP members were “caught on video blocking access to the polls, and physically threatening and verbally harassing voters during the Nov. 4, 2008, general election. Though it had basically won the case, [through default] the [Civil Rights Division] took the unusual move of voluntarily dismissing the charges , the letter said. “The division’s public rationale would send the wrong message entirely — that attempts at voter suppression will be tolerated and will not be vigorously prosecuted so long as the groups or individuals who engage in them fail to respond to the charges leveled against them. To date, the Washington Times says their request for records under the Freedom of Information Act (FOIA) has yielded nothing. AG Thomas Perrelli, whose word was the final decision, raised more than $500,000.00 for Obama for the presidential election. I cannot begin to express my high-volume anger right now. In case you are not white with anger…yet, one more reminder: these men never did respond to the charges or appear in court. Could you get away with this? I could not. 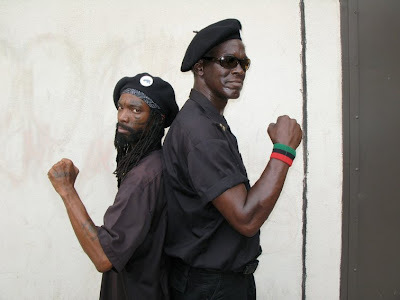 The New Black Panthers in Philadelphia want us to know how responsible and credible they are. They’ve “suspended” their chapter in that city “until further notice.” No elections to abuse coming up any time soon. Time to hit the streets and abuse someone there, or meet-up with ACORN for a little fun at the expense of voters everywhere. And what about Malik zulu Shabazz, who called Michelle Malkin a “political prostitute” – all cozy back home in Washington, D.C. where voters need no abuse to do the bidding of the New Black Panthers. In the photo above, King Samir Shabazz (L) and Jerry Jackson (R), both of Philadelphia. See them all in the video below.